Kalamar bay is some 5 minutes by car from Kalkan town centre and around 20 minutes to walk. It is the next little bay that sits to the right of Kalkan bay. Compared to Kalkan and districts around Kalkan bay, Kalamar is lower key in terms of bars, restaurants and social activities, however, it does have a well established and distinctly residential feel to it. There are several beach bars at Kalamar waterfront as well as a good number of smaller cafes and restaurants. Kalamar property prices are slightly lower than properties in Kalkan bay and arguably better value for money. There are a good number of waterfront properties in Kalamar bay with unobstructed views over the islands and spectacular sunsets. Kalkan town centre, with its authentic feel and age old cobbled streets, is bustling with cosy little bars and restaurants, where some of the best food and wine is served along the entire Turkish Mediterranean and Aegean coastlines. Kalkan town centre is compact and built around its ancient harbour. There are a good number of waterfront restaurants in Kalkan, around the harbour area, where time simply stands still, blending old charm with modern comforts. Properties in Kalkan town centre are mainly historic buildings from the town’s Greco / Turkish background, tastefully restored and primarily occupied by local businesses ranging from guest houses to souvenir shops and colourful restaurants. Most properties for sale in Kalkan town centre are resale villas and apartments overlooking Kalkan harbour and within walking distance of the seafront. There are very few new builds in Kalkan town centre. Kalkan town centre properties tend to attract premium rentals due to their convenient and desirable locations. Having said that if you are looking for a private home in Kalkan, where you are not overlooked, then Kalkan town centre may not be the right place. To the back of Kalkan town centre and situated toward Kalamar bay area is Ortaalan. 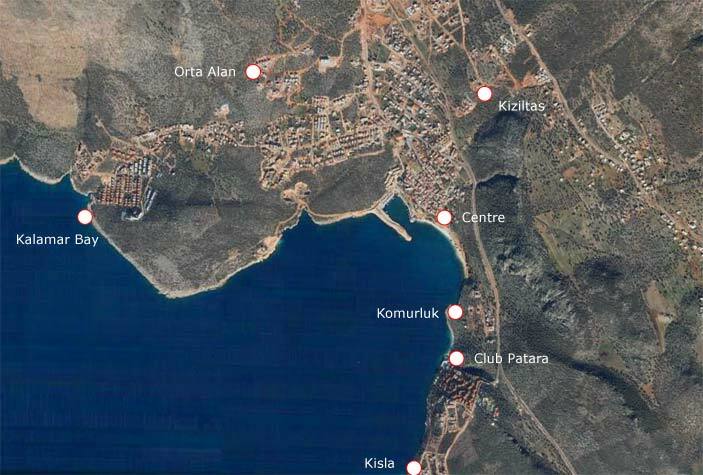 Ortaalan is Kalkan’s fastest developing district with some of the best contemporary designs for Kalkan properties. Due to its proximity to Kalkan town centre and Kalkan harbour, Ortaalan is attracting new Kalkan home buyers in search of panoramic views away from the bustle of Kalkan town but within easy reach of its restaurants, bars and social structure. Ortaalan sits right in the middle of Kalkan and Kalamar bays, thus enjoying spectacular views over both bays. Due to its elevation, some new build properties in Ortaalan overlook not only the two bays but Kalkan harbour at the same time. Komurluk and Kisla are where some of Kalkan’s most exclusive properties are located. Both Komurluk and Kisla have excellent views over the Mediterranean sea as well as Kalkan town centre, which is beautifully illuminated at night. Komurluk is a mere 4 minutes by car from Kalkan town centre and Kisla is another minute or two further to the east of Kalkan town centre. There are a number of established waterfront properties in Kisla and Komurluk with superb views and spacious private gardens. These are arguably Kalkan’s most attractive properties. Kisla and Komurluk areas also enjoy the benefits of beach platforms and jetties available for residents of waterfront properties.